-$10 off each piano for three or more pianos receiving similar service. For instance, if I tune 3 pianos biannually, I take $10 off the biannual pricing below for all three pianos. 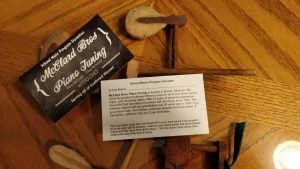 -Pre-performance Tuning – Free within 40 miles from Bolivar. Starting in August 2017, I will have tuning discount cards available for schools. School music programs can receive 3 free piano tunings with every 10 student referrals, along with a $100 donation from McClard Bros Piano Tuning. For each referral, I donate $10 back to the music program until we reach $100. With the referral card, the music program receives credit toward free tuning at the time of the student tuning. When 10 student referrals is reached, I will tune three school pianos for free and donate $100. Credit can also be used for one piano tuned three times. When a student piano is tuned, the filled out card for the school must be presented for credit.